When Barbara was working at Chez Panisse in the 1980’s, a colleague of hers – Robert Messick – took us to The San Francisco Opera to see ‘Othello’. In addition to his job at Chez Panisse, Robert was the staff photographer at the Opera, and had access to front row seats. Within the small group of opera lovers at Chez Panisse, these became known as ‘Robert Seats’, and watching an opera from one changed forever the way you looked at music. Not only was the performance enormously alive and vibrant, the ‘Robert Seats’ were next to the conductor, so close in fact that you could watch the active ones perspire. My modest love affair with opera began that night. We just received the schedule for the Fall 2019 opera season, and we wanted to get tickets for a performance of ‘Manon Lescaut’, so I called Robert. He wasn’t available and I left a message. An hour or so later he called back. He apologized for missing my call, but explained he was listening to a live PBS broadcast from the Met of Gaetano Donizetti’s ‘Daughter of the Regiment’. ‘I never interrupt an opera for a phone call,’ Robert stated. We talked briefly about ‘Daughter of the Regiment’, as I saw that opera with him ten years ago, and still had some questions about it. Asking Robert a question about opera is a little bit, I suspect, like asking Stan Musial about playing first base. You get a lot of details in the answers. After our post-performance dinner together and Robert’s report on the intricacies of the story, I’ve always been especially interested in ‘Daughter of the Regiment’. It’s an ‘opéra comique’, a form of opera developed by the French in the early 18th century, combining both songs and dialogue. While it has its lighthearted moments — for years it was regarded as ‘simple’ by some — it’s both serious and complex. Donizetti wrote the original score in Italian, but since he was living in Paris at the time of its debut, he agreed to write a second version in French for its premiere. It’s said that Donizetti never felt like he was fully appreciated by the French opera community, so he wrote into the heart of ‘Daughter of the Regiment’ a complicated aria sung by the hero, Tonio. It’s been called the ‘Mt. Everest’ for tenors, as it features nine high C’s sung in rapid succession, a feat that even today can be accomplished by only a handful of the most talented singers. The French tenor performing this inaugural production was frequently off pitch, and given its many other problems, ‘Daughter’ was originally panned by French music critics. French composer Hector Berlioz wrote about the work that ‘Donizetti seems to treat us like a conquered country’. 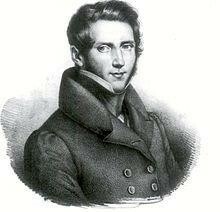 Donizetti, however, seemed more than a little pleased by his operatic ‘nose-thumbing’ to the French court. Today, ‘Daughter of the Regiment’ takes its rightful place as one of great examples of Italian musical genius. Writing opera is obviously difficult, even in one’s native language. Writing one in or for a foreign language is probably even more difficult. Writing an opera and planting in it a political statement of this scale might have seemed impossible – but not for Donizetti. He got his point across. I listened to Robert retell this story, and I was every bit as fascinated as I was after the San Francisco performance in October 2009. When we hung up this time though, my thoughts drifted off to wine – not surprisingly – and I began to think about our 2018 Chardonnay ‘304’, a wine we recently bottled. While on the road earlier this year, a customer tasted the 2017 Chardonnay ‘304’, then remarked to me that making a wine with no oak influence must be ‘a lot simpler’. It’s not, and I wish I had thought of the story behind Donizetti and his remarkable opéra-comique. To make a wine like this, Tadeo first must find grapes that can ripen over a longer stretch of time, in order to keep the natural acidity high and the pH low. Additionally, our Chardonnay ‘304’ relies on soil like that in Chablis which is both rocky and alluvial. This adds a touch of minerality to the wine. 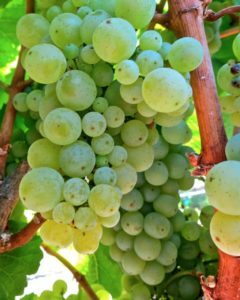 The grapes must be completely free of residual sulfur, to avoid the development of any awkward aromas. Properly made, the wine displays a complex aroma of ‘hazelnut’, a component the French call ‘Noisette’. A wine like this might appear ‘simple’ to produce, but like a great opera, it’s not. Our 2018 Chardonnay ‘304’ is shipping now. We love having it around for the spring, just as the warm weather arrives. I received word from winemaker Tadeo Borchardt last week that we finished bottling our 2018 Chardonnay ‘304’, and the wine is now ready to ship, so it’s timely to explain the idea behind this wine we produce with no oak contact, and the root of its name. The AVA for the 2018 vintage is ‘Sonoma County’, as once again we have combined fruit from the Larson Vineyard in Sonoma Carneros with fruit from the Trinchero Family Vineyard in the eastern Russian River Valley. Both vineyards were selected for their cool climate, necessary to keep the pH low and the total acidity high, and for their rocky soil base responsible for the characteristic minerality in the wine. The 2018 Chardonnay ‘304’ is especially lovely, with its combination of crisp acidity, refreshingly bright flavors and an expressive, lingering finish. The grapes were hand harvested in mid-October, whole cluster pressed, then using indigenous wild yeast allowed to ferment naturally in 3000-gallon stainless steel fermentation tanks. To increase contact with the yeast lees, we adopted a traditional Chablis technique of gently circulating the lees over the top of the fermenting wine, a process that adds texture, flavor and stability to the finished wine. This circulation or pump-over allows for lees stirring in a tank otherwise too large for manual ‘battonage’. The wine then continues aging on the lees for about four months after fermentation is complete. The 2018 Chardonnay ‘304’ completed 50% of a natural malo-lactic fermentation. The finished wine was lightly filtered and is now ready to enjoy. The name ‘304’ comes from the grade of stainless steel that is used to fabricate wine fermentation tanks. The process begins with basic steel to which Nickel and Chromium is added during the smelting process. The result is ‘Food Grade’ stainless steel, which is easily cleaned, non-corrosive and anti-bacterial. The Gateway Arch in St. Louis is made of stainless steel ‘304’ because of the alloy’s anti-oxidative qualities, and it’s been shining bright since 1965. Past vintages of this wine have been an eye-opener for many as they display the charm of new-world Chardonnay, while offering the satisfaction, complexity and flavor range we associate with traditional oak-free wines, especially those from Chablis and the Côte Chalonnaise. We are just wild about this newly released bottling of Pinot Noir. The fruit came entirely from a one-acre parcel of heirloom vines on Chuy Ordaz’s Russian River Valley vineyard. Chuy sourced the budwood from the old Joe Swan Pinot Noir Vineyard in Forestville. This plant material originated in Vosne-Romanée, and was never subjected to the plant indexing and cloning program at U.C. Davis, adding to its historical importance. 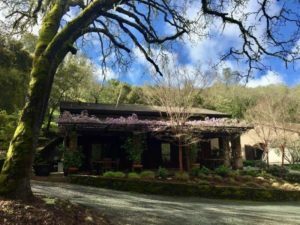 Terra Restaurant opened in St. Helena in 1988, and it was clear from the start that it was going to be a big deal in the Napa Valley. It was founded by Carl Doumani, the legendary figure who rebuilt the original Stags’ Leap Winery Estate in the early 1970’s. Recognized for his taste as an art collector, respected for his success as a vigneron, and admired for his wisdom as a businessman, Carl has never failed at anything. In the mid 1980’s, his oldest daughter Lissa became the pastry chef at Wolfgang Puck’s Spago in Hollywood, and later married Spago’s talented chef Hiro Sone. 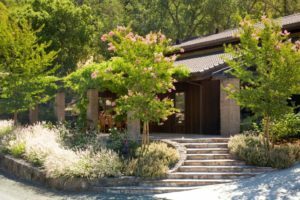 When the beautiful fieldstone Duckworth building in St. Helena came on the market in 1987, Carl bought it for a restaurant, with plans to install Lissa and Hiro as the operating partners. Their agreement with Spago still had several months to run, however, so Carl persuaded Barbara Neyers – yes, that Barbara Neyers — to take a leave of absence from Chez Panisse and serve as the temporary Manager. Her primary responsibility was to hire and train the staff until Lissa and Hiro arrived to run the business. It soon became one of the most popular restaurants in town, and after Barbara moved on we still ate there frequently. In June of 1995 Barbara and I celebrated an important anniversary at Terra, and when we entered the restaurant, the hostess – a young woman who Barbara had hired – led us to our favorite table, in the far corner of the main dining room. She mentioned that we would be sitting next to Ruth Bader Ginsburg and her husband, who were celebrating their wedding anniversary. Justice Ginsburg had just been confirmed to the US Supreme Court, and had already begun establishing the reputation that follows her still today. As we approached their table, we noticed that they were drinking a bottle of Neyers Cabernet Sauvignon, thanks to the help of a clever server. We had brought some older wines for the evening, and after they were opened, Justice Ginsburg turned to us and mentioned how much they enjoyed our wine. I thanked her, and congratulated them on their anniversary. We poured them a glass of one of the wines we brought with us – a red Bordeaux — and she remarked that our wine was better. I didn’t argue. Later their check arrived, and we said goodnight to them, as the evening concluded. But as they walked towards the exit, I grabbed a copy of the day’s dinner menu, and handed it to her with my pen, asking for her autograph. She wrote us a lovely note, signed the menu, which I later had framed. It hangs on the wall in my office today, as a constant reminder of this marvelous woman, notable for her intellect, her fairmindedness, and her genial disposition — to say nothing of her taste in Cabernet Sauvignon. It was exhilarating to have met her. Over the past 20 years we have produced Cabernet Sauvignon only from our Conn Valley Ranch, on the vines Dave Abreu planted for us in 1994 and 1996. We have just begun to ship the 2016 Cabernet Sauvignon ‘Neyers Ranch’, and Dave would be proud of the wine we made from those vines. 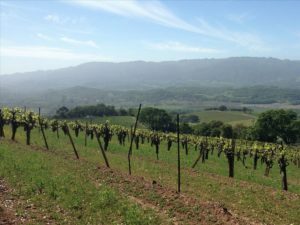 Planted using 3’ by 6’ spacing, in rows that run east and west parallel to the arc of the sun, the vines are farmed organically and sustainably. Budwood came from the Thorvilas Vineyard that Abreu also manages. This plant material is believed to have originated at Château Margaux. From ten acres of vines, we harvested a total of 25 tons. We think of this wine as one with an especially bright future, and we’re intrigued with its combination of ripe cherry flavors, slight minerality, and an aroma of tobacco leaf. There is an underlying suggestion of chocolate, something I have long appreciated in Napa Valley Cabernet. Barbara and I traveled to Lake Tahoe recently on a sales trip planned with our California distributor’s ‘Mountain Man’, Jeremiah Schwartz. Jeremiah is the Sierra resort area’s most respected wine salesman, and I’d been looking forward to working with him for some time. Ski season in northern California usually begins at Christmas, and this year the Tahoe resorts were getting off to an early start with an unseasonably deep snow pack. Our day promised to be a busy one. Jeremiah planned to begin on Tuesday morning, so we opted to leave home on Monday for the long drive. This allowed time to stop in Sacramento for one of life’s greatest pleasures — a visit to Corti Brothers Grocery Store, arguably the world’s finest source of rare and original foodstuffs. 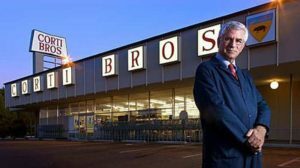 The owner and genius behind Corti Brothers is Darrell Corti, a man whose knowledge is beyond words. Darrell invited us to join him for lunch at one of his favorite Sacramento restaurants, The Waterboy on Capitol Avenue. We arrived at the store an hour earlier than expected though, as we wanted to spend some time walking through the aisles, searching for treasures. Barbara had just received the Corti Brothers ‘Holiday Season 2018’ brochure, and when I came home and found her standing up in the kitchen reading it, she had already circled ten or eleven items — artichoke hearts in olive oil from Abruzzo, wild rice from Minnesota, air-dried Baccalà from Norway, dried pasta from Trento, fine salt from Japan, and luxurious handmade soap from Liguria. Within an hour after we arrived at the store, we had located all of the circled items on her list, then filled up another cart with breadsticks, prosciutto, fresh fava beans, tomato sauces, olive oil, blood oranges, pistachios, dried salami, an assortment of marmalade, and a selection of biscotti that would rival the greatest bakery in Milano. We had barely made it through half of the store. We had two bags of provisions to take home at the end of our trip, with some black truffles still to be shipped. Darrell was busy waiting on customers, but as he saw us leaving with our shopping bags, he told us to meet him in the parking lot behind the store. We loaded into his car and headed off to lunch. The Waterboy bills itself as a casual neighborhood restaurant, and once you visit there you’ll wish it was in your neighborhood. The menu is a thoughtful mix of dishes from northern Italy, southern France, and California. The special that day was ‘Pasta e Fagioli’, a traditional Italian soup that often serves as a meal in itself. The restaurant was donating a portion of that day’s proceeds from sales of the soup to victims of the recent northern California wildfires, and each of us ordered it as a starter. It arrived, looking and smelling delicious, and was placed before us amidst a loud chorus of ‘wows’. It’s basically a soup of pasta and beans, in a flavorful broth of olive oil, garlic, herbs and sautéed vegetables. It has been called the most national dish of Italy, as each Italian region has its own, local version. This version was simply delicious. Barbara indicated she’d like to make the soup when we returned home, so I asked Darrell which pasta we should use. He began by explaining that the normal version of Pasta e Fagioli was made with a wide rigatoni called ‘Mezze Maniche’. The soup before us, he went on, was made using ‘Orecchiette’ or ‘little ears’, a pasta more common in southern Italy. This was perfectly fine, Darrell explained, but using ‘ditalini’ or ‘ditaloni’ would have been more consistent with the northern Italy direction of the kitchen. No question Darrell fields gets a casual answer. I bit into the garlic crouton accompanying the soup. Confirming that this was a place where attention to small details is important, it was absolute perfection – crisp yet chewy. We finished our lunch, said our goodbyes, and headed off to Lake Tahoe. We returned home later in the week with our several bags of gourmet treasures, and Barbara announced that she had located a recipe for the ‘Pasta e Fagioli’. It came from her longtime friend and former Chez Panisse colleague, David Tanis. David now writes a weekly column for the ‘New York Times, and with David’s help, Barbara prepared Pasta e Fagioli, using our Corti Brothers ingredients. It was delicious. I opened a bottle of Neyers Carignan from the ‘Evangelho Vineyard’, a wine I especially like to drink when Barbara is being creative in the kitchen. Grapes for this wine come from vines more than 140 years-old. 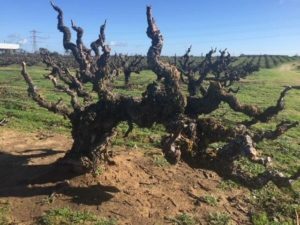 They are own-rooted – not grafted on to rootstock — as the soil is too sandy for Phylloxera to live. The crop yield is barely one ton per acre. Tadeo insists on crushing the grapes by foot – no mechanical crushing device is used – and the wine macerates on the skins for 35 to 40 days before we drain the tank and press the skins. It’s a strikingly attractive wine, with a bright ruby color, and an exotic aroma of tropical fruit, mineral and wild plum. Most importantly, it’s soft already, and just as easy to drink by the glass as by the bottle. By the way, if you don’t already receive the monthly brochure from Corti Brothers, contact them at http://www.cortibrothers.com and ask to be included. It’s a great read. The Neyers 2017 Sage Canyon Red is a blend of 45% Carignan, 25% Grenache, 15% Mourvèdre and 15% Syrah. We retain 100% of the stems during the long skin contact fermentation – using exclusively wild, natural yeast – so the grapes are crushed entirely by foot, using a traditional French ‘Pigeage’. There is no mechanical grape crushing. The new wine is then aged 1 year in 60-gallon French oak barrels. The 2017 may be the finest version to date. The photo here is of our winery tasting room last spring, with the winery in the background. Both are in the heart of the Sage Canyon region of Napa Valley. This is the time of year when Barbara often roasts a chicken on Sunday, and our favorite wine for that meal is the Sage Canyon Red. We are currently offering the 2017 Sage Canyon Red, a blend of 45% Carignan, 25% Grenache, 15% Mourvèdre and 15% Syrah. It’s delicious with pot roast too. The photo above is an old Carignan vine on the Evangelho property in Oakley. Beginning this Sunday January 6, the winery will be open for visitors from 10:00am to 3:30pm on the first Sunday of every month. 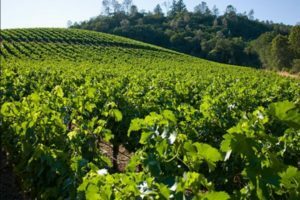 Under Napa County regulations, visitors must make prior arrangements with us before they visit, and that can be done by calling us at 707/963-8840, or visiting our website, HTTP/NeyersVineyards.com. Relax a little and come enjoy our remarkable wines with our special brand of hospitality at Neyers Vineyards. We’ll hope to see you. If you miss us on January 6, we will be open again on Sunday, February 3. Barbara and I traveled to Lake Tahoe recently on a sales trip planned with our California distributor’s ‘Mountain Man’, Jeremiah Schwartz. Jeremiah is the Sierra resort area’s most respected wine salesman, and I’d been looking forward to working with him for some time. Ski season in northern California usually begins at Christmas, and this year the Tahoe resorts were getting off to an early start, with an unseasonably deep snow pack. Our day promised to be a busy one. Jeremiah planned to begin on Tuesday morning, so we opted to leave home on Monday for the long drive. This allowed time to stop in Sacramento for one of life’s greatest pleasures — a visit to Corti Brothers Grocery Store, arguably the world’s finest source of rare and original foodstuffs. The owner and genius behind Corti Brothers is Darrell Corti, a man whose knowledge is beyond words. Darrell invited us to join him for lunch at one of his favorite Sacramento restaurants, The Waterboy on Capitol Avenue. We arrived at the store an hour earlier than expected though, as we wanted to spend some time walking through the aisles, searching for treasures. Barbara had just received the Corti Brothers ‘Holiday Season 2018’ brochure, and when I came home and found her standing up in the kitchen reading it, she had already circled ten or eleven items — artichoke hearts in olive oil from Abruzzo, wild rice from Minnesota, air-dried Baccalà from Norway, dried pasta from Trento, fine salt from Japan, and luxurious handmade soap from Liguria. Within an hour after we arrived at the store, we had located all of the circled items on her list, then filled up another cart with breadsticks, prosciutto, fresh fava beans, tomato sauces, olive oil, blood oranges, pistachios, dried salami, an assortment of marmalade, and a selection of biscotti that would rival the greatest bakery in Milano. We had barely made it through half of the store. We had two bags of provisions to take home at the end of our trip, with some black truffles still to be shipped. Darrell was busy waiting on customers, but as he saw us leaving with our shopping bags, he told us to meet him in the parking lot behind the store. We loaded into his car and headed off to lunch. The Waterboy bills itself as a casual neighborhood restaurant, and once you visit there you’ll wish it was in your neighborhood. The menu is a thoughtful mix of dishes from northern Italy, southern France, and California. The special that day was ‘Pasta e Fagioli’, a traditional Italian soup that often serves as a meal in itself. The restaurant was donating a portion of that day’s proceeds from sales of the soup to victims of the recent northern California wildfires, and each of us ordered it as a starter. It arrived, looking and smelling delicious, and was placed before us amidst a loud chorus of ‘wows’. It’s basically a soup of pasta and beans, in a flavorful broth of olive oil, garlic, herbs and sautéed vegetables. It has been called the most national dish of Italy, as each Italian region has its own, local version. This version was simply delicious. Barbara indicated she’d like to make the soup when we returned home, so I asked Darrell which pasta we should use. He began by explaining that the normal version of Pasta e Fagioli was made with a wide rigatoni called ‘Mezze Maniche’. The soup before us, he went on, was made using ‘Orecchiette’ or ‘little ears’, a pasta more common in southern Italy. This was perfectly fine, Darrell explained, but using ‘ditalini’ or ‘ditaloni’ would have been more consistent with the northern Italy direction of the kitchen. No question Darrell fields gets a casual answer. I bit into the garlic crouton accompanying the soup. Confirming that this was a place where attention to small details is important, it was absolute perfection – crisp yet chewy. We finished our lunch, said our goodbyes, and headed off to Lake Tahoe. We returned home later in the week with our several bags of gourmet treasures, and Barbara announced that she had located a recipe for the ‘Pasta e Fagioli’. It came from her longtime friend and former Chez Panisse colleague, David Tanis. David now writes a weekly column for the ‘New York Times, and with David’s help, Barbara prepared Pasta e Fagioli, using our Corti Brothers ingredients. It was delicious. I opened a bottle of Neyers Carignan from the ‘Evangelho Vineyard’, a wine I especially like to drink when Barbara is being creative in the kitchen. We bottled the 2017 Carignan in July, so I was eager to see how it was developing. Grapes for this wine come from vines more than 140 years-old. They are own-rooted – not grafted on to rootstock — as the soil is too sandy for Phylloxera to live. The crop yield is barely one ton per acre. Tadeo insists on crushing the grapes by foot – no mechanical crushing device is used – and the wine macerates on the skins for 35 to 40 days before we drain the tank and press the skins. It’s a strikingly attractive wine, with a bright ruby color, and an exotic aroma of tropical fruit, mineral and wild plum. Most importantly, it’s soft already, and just as easy to drink by the glass as by the bottle. The crop in 2017 was small, and from the five ton harvest we have barely 100 cases remaining. It’s going to be a favorite of mine for some time. 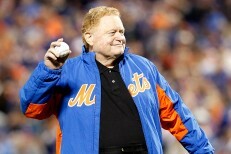 I met Rusty Staub 30 years ago on a summer afternoon when he drove up to the Napa Valley after broadcasting a NY Mets game at Candlestick. He was a wine buff and had been given my name by a mutual friend, so he stopped by my office to visit. We talked for a bit, then tasted a few wines, but before he left we agreed to get together for dinner during his next trip to the Bay Area. A month or so later he was back, and accepted my invitation to join us at home. Rusty was a great cook, but when he learned that Barbara worked at Chez Panisse he enthusiastically agreed to be merely a guest. He really couldn’t help himself though, and on his way to our place, he called to report that he had stopped at a fish market and bought some fresh salmon filets. He was marinating them on the drive, and wanted to grill them – himself – as our first course. I agreed, and walked outside to fire up the mesquite grill. We had invited a handful of friends to join us, and each brought some wine, but I knew Rusty loved Syrah so I had selected a few bottles of Northern Rhône wines from my cellar. Not surprisingly, I included a Neyers Syrah in the mix. Barbara had prepared a Daube of Beef, which was served after our grilled salmon starter. With the Daube, I opened magnums of St. Joseph from Trollat, Cornas from Auguste Clape and Noël Verset, Hermitage from Chave, and Côte-Rôtie from Jasmin, and Gentaz. I added a magnum of Neyers 1994 Syrah, and we began to taste through them all. I think of Rusty and his love for Syrah every time I go into my cellar and bring out a bottle from one of my heroes. I think of him as well when Barbara cooks her Daube of Beef. She plans to prepare one next week to serve with our newly bottled 2017 Neyers Vineyards Syrah ‘Garys’ Vineyard’. After tasting it last week with Tadeo, I feel it’s a great success. Rusty would like it, I’m sure.